In the previous article, I spoke on how I believe buy and hold investing is no longer going to provide a good return on investment. In reality, it never has apart from the dramatic ride the market took from 1982 to 1999. The stock market historically pays an interest rate of 3.73%. If you don’t believe me see Buy and Hold Investing is Dead. Here I’ll give you a few tips on how you can dramatically improve your results with investing. This is for educational purposes only and I’m not providing investment advice, just investment theory. In fact, I don’t think you should buy stock if you don’t know what you’re doing. Forget everything you know about asset allocation. This is the act of indiscriminately combining stocks and bonds in a portfolio. We are going to instead use math to build a portfolio with a risk level you are comfortable with and then get you the greatest return at that risk level. By using some math formulas we can make highly accurate predictions on what would be the maximum potential loss for a given portfolio. Then you can decide on how much potential risk your willing to take and then know that your portfolio will act accordingly. Treasury bill’s will represent the least risky investment in my portfolio. While penny stocks (stock’s worth less than $5) will represent my riskiest investment. I will for now not include options in this portfolio, because they may confuse you. It’s impossible to make the best portfolio without them, but I’ll leave them for a later article. Just know that how you structure your portfolio will determine your result’s in 94% of day to day market movement’s. Let me assume, that I can expect ABC company to increase in value by 25% after 10 years. I then must only fear that I’ll be forced to withdraw at a point when the value has unexpectedly fallen. This rise and fall from the average growth rate is known as Standard Deviation. When people talk about risk, they are referring to Standard Deviation. As you add more risk to your portfolio, you are increasing the chance that it’s price will deviate from an expected return. But, my risk less 1 year treasury bill is only paying me .35%. I’m guaranteed to get that .35%, but I can also be sure that inflation will be higher than .35%. I’m not telling you to buy any of these mutual funds! Actually many don’t exist, have new money managers or are closed to new investors. Let’s look at the best performer, being Smith Barney Aggr Growth. It provided it’s investors an average return of 27.83%, and in any one year was expected to provide a minimum return of 18.03 % = 27.83 – 9.8. 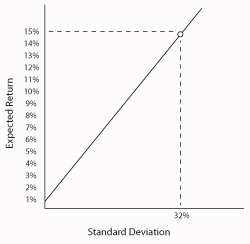 This number is calculated this way: Worst Expected Return = Average Return – Standard Deviation. Let me stop for a moment to explain why these investment’s don’t exist anymore. By buying this mutual fund you received at worst a return of 18.03% per year, and at best 37.63%. Whats funny is that when I was a broker, people thought this was a bad return! Seriously! I just want you to understand this new way of looking at securitys. Think not only about expected average returns but also think of their deviation from this average. If you understand that the goal is not just to get a good average return, but also to minimize standard deviation, you really are starting to understand investing. As you see the portfolio I’m emphasizing has an expected return of 15%, the only problem is the standard deviation is 32%. This mean’s if I’m comfortable potentially losing 17%, this is a good portfolio, if not it’s bad. Most people think that blind diversification will protect them from risk. They think it is a good idea to randomly add different investments to their portfolio. Wrong! 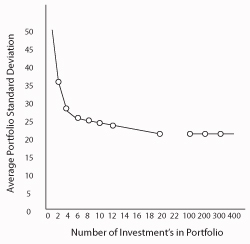 As you can see in this chart, if a computer randomly pulls together a portfolio, you are no longer able to minimize Standard Deviation simply through diversification after you reach 20 random investments. I then continue to show you the result’s with 100, 200, etc. We get the following graph. I’ve already described what the CAL line is. The little dots represent all of the investment opportunities out there. The line that curves away from the CAL is known as the Efficient Frontier. It represents all portfolio’s with the best return at the lowest standard deviation. The Optimal Portfolio represents the point in which you are getting the best return at the lowest risk level. 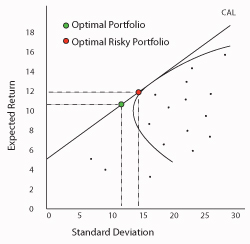 The Optimal Risky Portfolio represents the point at which you receive the highest return versus all other possible portfolio mixes. If you are a bit confused don’t worry. It comes down to this simple concept. We want to create a portfolio that will provide the best return, with the lowest amount of risk. That’s it! But, how is the optimal portfolio created? If you understand standard deviation, there is just one more piece to this puzzle. Covariance! I wrote in the last article about how when some stock’s go up others tend to go down. A candy companys growth potential is directly related to the price of sugar. So if sugar price’s sky rocket, chances are the candy companys stock will fall. This is known as Covariance. It’s a measure of the degree to which two assets value’s move in tandem. If 2 stocks have a negative covariance that means they move more opposite from one another. So one way to hedge risk in one asset is to find the other assets that effect it’s value and add them to the portfolio. This act helps to minimize standard deviation. As mentioned before, a hedge fund named NWQ (North West Quadrant) made huge returns based purely off of creating Optimal Portfolio’s. Their name refers to the Efficient Frontier. They constantly readjusted their portfolio’s based off of expected changes in expected return’s and standard deviations. Then all you have to worry about is general market risk. As history has shown us though, market risk only will effect you 6% of the time with the right asset mix. And, if you think doing all this is way to complicated, in my opinion, don’t buy stock if you don’t want to do it intelligently. If you think a brokerage house will do this research for you, I say again good luck! If you have any question’s leave them in the comment section below. I’ve been reading your blog over the last couple days and have found it very interesting and addicting. Your presentation style is very effective and obviously well thought out. You seem to have good advice in a lot of different areas. I actually found a few of your tutorials by searching for stuff on Python and MySQL, then from there wandered into your financial stuff. I would like to learn more about the Efficiency Frontier and this kind of investing. I would love to see more stuff from you, but in the meantime can you recommend some other resources to look at? I imagine that you have written your own software to calculate the average return and standard deviation, but for those of us without the skill or time can you recommend some software that would help use do this kind of research on our own. I’m glad you find my little site useful 🙂 In regards to the creation of efficient portfolios I created software during the beginning of this century that created them based off of the entire pool of stocks, many different types of bonds and derivatives. It worked very nicely. The reason I haven’t provided it to the public is because it stopped working properly around 2006. Things started to not make sense anymore. I think flash trading had a lot to do with all of the noise my program was seeing. The derivatives market went nuts also. I wasn’t intelligent enough to see what was coming for the financial system, but I was smart enough to get out. So I quit my job and went in a new direction. Another new thing that occurred around that time and continues to this day, is the mass influx of money into etfs. In my opinion if everyone is doing the same thing someone will figure out a way to take advantage of that. I think my efficient portfolios were doing so well because nobody was doing it at the time. It wasn’t my idea by the way. I was following the work of a hedge fund called NWQ. Get it North West Quadrant! The efficient frontier. Either way, I’ll cover more on investing in the future. I expect their to be another major correction over the next 2 years. My software is telling me that anyway? I hope all of that rambling makes sense. The best book I’ve read on investing is Investments and the best book on derivatives is Options Trading The Hidden Reality in my opinion. Thank you 🙂 Very few people know I exist, but most people that find there way here seem to be very nice. I’m glad you enjoy the site.